Determination is why I'm here, looking out the small window of a British Air jetliner at clouds, a distant sunrise, and a glimpse of ocean every now and then. But that's not what I want to see. I'm looking for land because when I see a patch of green between the clouds it will be the second time I have laid eyes in England from the air but it feels like the first.. When the patch of green finally does appear I stay glued to the window until the plane turns and it's out of my sight again. I have waited a long time for this; it started almost two years ago with a pact between 5 friends to ride motorbikes to the TT races on the Isle of Man. There are however only two of us traveling together and that makes a 60% dropout rate. That's why I say determination. But two years is only a small part of the story I've been dreaming of this since is was a kid. Shaun sitting next to me is just getting to the end of "Notes from a small island" by Bill Bryson. The book I lent him before we departed, it's a humorous look a life in England and he has been chuckling on and off for the whole flight. More like laughing out loud. This is his second time as well but it will be the first time either of us will get on a bike here. Picking up the car at the airport was easy the woman at the counter wanted to make sure that we were not going to take it off the "main land" I thought "we are on an island aren't we?" But I just said yes that's right... I guess if you live there England doesn't seem like an island, it's the rest of us who make the mistake. The next stop after breaky of course was Box Hill to the south of London. From the British bike mags I have been reading I have picked up a few things on the culture of motorcyclist in England. And the Sunday morning gathering of bikes at Box Hill is one of them. It's basically what we in the USA would call a rest area just off the Brighten road(I think) there is a large parking lot, a public toilet and a counter where you can get a hot cup of tea and not much else. But on this Sunday morning there is diverse and large selection of bikes and bikers. Much larger variety of bikes then we are used to in the southeastern US. The biggest differences that first hit me are the inclusion of 2 strokes and the lack of HD's. Both of these differences are welcome sight to me. After walking around I notice many more Japanese bikes that are obviously the pride of their owners. For new examples that might not seem very remarkable, but it's also the older ones and they really show the differences from the land of Dixie. I do find the "live with there bikes" kind of biker in this group. The difference is instead of riding Harleys here they are on Suzukes. I start a short conversation with a fellow who drove his lotus Elise that morning, a cottage industry sports car that is not imported to the US. I am fascinated to see one on the road but he dismisses it as just another car. I guess that's to be expected at a bike meet. As I'm wishing him a good day a group of 15 or so 50cc mini bikes do a parade around the parking lot and the head out on the road again. Now that is something you would not see where I come from. Back on the road and north toward London we are going to attempt to find the Ace Cafe. We locate the North Circular easily enough but then go back an forth several times in the place where it should be with no luck. Oh well, we have to be in Nottingham tomorrow so it's time to go. Next stop is Milton Keys which is not very far to travel in one day but we spent a lot of time trying to get out of London not to mention not finding the Ace. Really we just drove until it was time for dinner and that's when Milton Keys appeared. We stopped at a pub called the Galleon and ordered Pints but where dismayed to find no grub on the bill of fare. I was so looking forward to Pub Grub. But the locals turned us on to a Chinese delivery and soon we where chowing down on noodles and stir-fry. The next thing on our list was a place to stay. After a bit of discussion the publican offered to let us use the beer garden behind the pub and though it was cold we took him up on the offer. But thanks to Shaun's unabashed charm and two young ladies we met in the beer garden we ended up with our sleeping bags on the floor of their living room. Warm and cozy, we slept soundly after a long night visiting with our new friends. The two women and a 5 or 6 year old daughter all piled into our car for the short drive to their house. In the darkness I backed into the corner of a flat bed truck and cracked the tail light of our car. So we ended up trading a bit of good luck for a bit of bad. I remember in the morning the woman whose house we where staying in being very gracious even as Shaun was arguing with her over politics or some other pointless topic. I did what I could to smooth over the conversation and got us out of there as soon as I could. Driving along dreaming of small motorbikes, canal boats, and a whole different kind life I suddenly saw a sign for Mallory Park. Thanks again to British motorcycle mags I had stumbled upon another name I knew. Seeing as this was and improvised itinerary I took the turning of course. As luck would have it this was a bank holiday and low and behold there was a motorcycle race going on as we drove up to the track. Shaun was still fast asleep and I considered waking him but there was a pub in the car park so I decided to let him sleep and went in for a pint. There was too much history for me to take-in trophies in the pub and statues in the car park to famous drivers and marques where everywhere. Lotus, Ferrari, Porsche. Triumph, Norton. On and on it went. When I was done with my pint I went back to the car but Shaun was gone so I put down 10 pounds on a ticket and went to watch the races. I found Shaun of course and we had a great time watching the racing action, including side-car races. Like club races in the US we where able to walk around the pits and talk with competitors and their "teams". I was set straight about what to call the side cars after I referred to them as "worms". These vehicles where know as "outfits" while longer wheel base units that where used in the now defunct FIM class are called "worms". We arrived in Nottingham in early afternoon and a call to Bill Roughton got us directions to his house which is where he operates his touring business from. Bill is a fabulous host and he and his family made us feel right at home. He sent us to a reasonable hotel and pub, introduced us to other people who where going with us and helped us get our hire car turned in. we decided right a way to spend the next day helping Bill service several of the bikes he was hiring out for the trip we where taking the following day. A day wrenching on bikes cemented our friendship. Also a night at the oldest pub in England didn't hurt. Built into the living rock at the foot of the cliff below Nottingham castle "Ye Old Trip To Jerusalem" started life as a hangout for departing crusaders and is dated in the 12th century. That makes it at least 4 times older than my country. The day of departure arrived and brought rain with it we where waiting for some other folks to arrive from London as well as the rain to stop. Everybody finally show up but the rain never let up so my first ride on English roads was a wet one. And it was a fast one. A group of 8 of us left after lunch in the rain for the village of Dent in the Yorkshire dells. First on the roads on the outskirts of Nottingham where I got a crash course in "lane-spliting" and then on the motorway where speeds reached the ton and above from time to time. The Bike I was riding is a whole story in itself. It was a brand new Triumph Bonneville Thruxton. Which as I write that it occurs to me it's a cross Atlantic name, a strange mixture of two race tracks. The Bonneville Salt Flats that is used for world record speed events and a roadrace course in the UK. The bike was owned by a Texan, but lived in Nottingham with Bill. Not only that it was only a few months old and I was told that I needed to take extra special care of it when I first reserved it several months ago. But in the interim Bill had hired it out to the local Vicar thinking that he would be gentle with it if anybody would. But the vicar had run it off the road and broken the mirror off as well as put some minor scratches on it. It was one of the bikes that I worked on the day before. I was thrilled to find the Thruxton for my TT adventure. It reminded me of many of the Triumphs I had owned in my youth. It is a retro styled motorcycle built with contemporary technology, it's light and nimble but not an overly powerful bike. I was very comfortable with it but I was using all of it's motor just too keep up with the group during the fast bits on the motorway. However I got a little bit of redemption when we got in the dells with their narrow country lanes between stone walls in the middle of these amazing green rolling hills. In a short time I went from the back of the pack to the front and soon was out of sight 3 or 4 corners ahead of them. We arrived in Dent still in the rain where most of our group had a room in a B&B but Shaun and I had elected to camp. Oh well pitching a tent in the rain is fun right? In the morning you guessed it we woke to the sound of rain. Rolling up a tent in the rain is not as much fun as pitching if you can believe that. We had used the drying closets in the bathhouse to dry our wet gear and I forgot my umbrella in there when packing up in the morning so that was the first casualty of the trip. Dinner at the pub in town was warm and cozy and the first chance to have a conversation with a lot of the guys we where riding with. I was talking with a young fellow from South Africa, when I mentioned how much fun the ride from Nott had been he scowled and started bitching about the rain and how in S.A. the roads would have been straighter and wider and we would not have got below 100mph for the whole trip. I found someone else to talk to; I can't even remember that guy's name. By this time Shaun and I had gained a traveling companion Andrew Jones "Jonesy" and the three of us where riding together at the back of the group." Due to a "traffic jam" At a crazy 3 way intersection in the middle of farm land involving a farm tractor a van and a bunch of motorcycles the three of us got separated from our tour leader. With only the vaguest idea of which to go we soldered on, in the now pouring down rain, asking directions at least once. Our first destination that morning was Devil's Bridge in the village of Kirkby Lonsdale a place I had actually been to before. It was 9 years before during a sunny day arriving from a different direction in a car and until we actually got there it helped me out not in the slightest. Well I guess it did boost my confidence but with no real merit. By the time we got to the tea trailer for a cupa' and a bite the rain had stopped and I think we saw no more rain for the rest of the trip. The ride from Kirkby Lonsdale to Heysham on Morecambe Bay was uneventful. 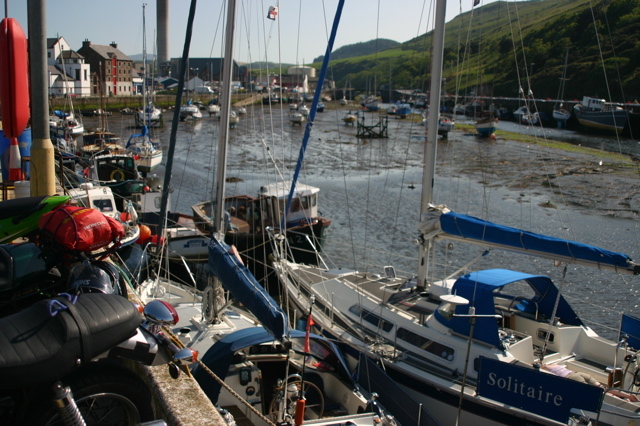 I did venture off on my own because we had plenty of time to get to the docks and I knew we had no place to stay on our return which was scheduled for around midnight about ten days from now. So I decided to scout for a hotel, I had no luck and time was running out so I beat feet to the docks to wait for the ferry. The place was over run with bikes, riders dockhands and a large crowd had formed. 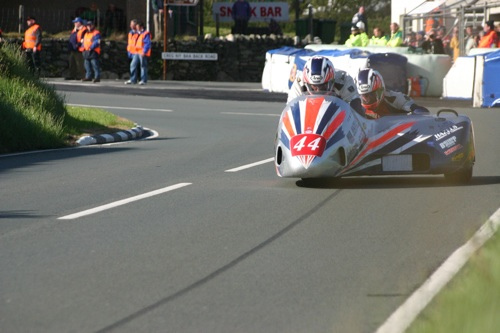 I remember meeting a bloke from Wales riding a Hyabusa who was also on his first trip to the TT. They formed us into two parallel lines as we waited for the boat to arrive and I was there for about an hour before we began to load. I found the rest of my group and just hung around the terminal, which was just an office really. There was a band playing in the main room with no one watching and a ticket window and that was all. We waited outside with the bikes with warm Styrofoam cups of tea. Loading the bikes was a unique experience. We where directed to park our bikes on the kickstands 2 or 3 abreast in the width of one car lane. They would then lash a rope from a 3-foot high railing over the seat of the bike next to it and secure it to the foot peg then back over the seat to the other foot peg on the kickstand side of the bike which is the side closest to the railing. Then back over the seat and over the seat of the next bike and lash it to its foot peg. It was quick and 2 or 3 bikes could be lash to one bike length of railing. A ferryboat full of bikes headed to the Isle of Man is one of my favorite experiences. It's crowded, tiring, expensive, a little uncomfortable, and a little boring but I had a blast. We got to Douglas in the late afternoon and quickly lined up behind Bill our leader and rode off for the campground. The camp was a large grassy field which was part of a working farm and all the adjoining fields where full of sheep. It was also right on the racetrack and a beautiful setting. This would be our home for the next 10 days. There was a little shop where you could get a bacon butty and a cup of tea as well as a bar of soap and a shower card, which cost a pound and got you 5 min. of warm water to wash with. I felt at home pretty quickly. Jonesy, Shaun and I pitched our tents got a bap for dinner and then took a walk to the pub in Union Mills about a mile down the road. The Railway Inn was standing room only at first but it thinned out as time went on. And was another great pub. England seems to be full of great pubs. I think that's why I love it here so much. The railway sits right in the middle of an "S" curve on the TT course and the front door is maybe 10 to 15 feet from the edge of the road. There is limited space just outside the front door to watch racing and in the beer garden next to pub. The beer garden is about 5 feet straight up from the road and the view is down on the track. As you can imagine it's a great place to watch race bikes go by. But diagonally across from the pub is a church and on the lawn in front the ladies of the congregation set up tea tables and they do a brisk business selling tea and sandwiches to spectators. The next day was not a race day so we went exploring. 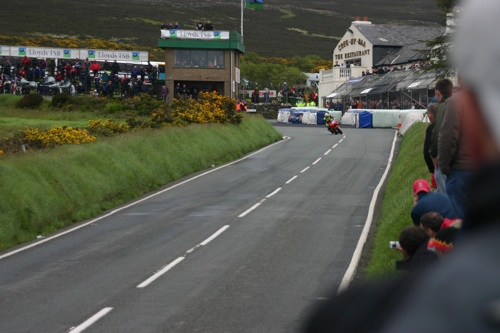 One of the cool things about the TT is that racing is every other day for a week. So you can spend one day spectating and the next riding and sight seeing. And if you've any interest there is a lot to see. 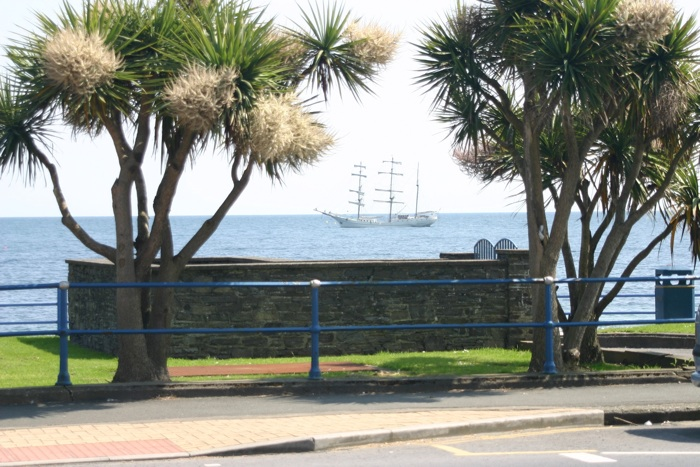 The rugged coast to the north and the south of Douglas is spectacular you ride along high above the sea and look down on rocky jagged cliffs and coastline. By now I was getting accustomed to riding on the other side of the road so much so that on the way down to castle town near southern end of the island I passed a motorcycle who was riding near the center line on the left between him and the curb of the lane we shared. He came up beside me and motioned for me pull over. When we got to the side of the road he started lecturing me about my driving. This caught me a little off guard because this had happened to me several times already. I thought he was going to warn me about something falling off my bike. I decided to be non-confrontational and simply apologized for scaring him. And went about my business, which included passing people in that manner if the need arose. Latter Jonesy pointed out that he had a Manx emblem on his number plate and we surmised he was a local trying to calm down the tourists. We found a pub in castle town right on the quayside and had a pint outside and looked one way toward a dry harbor and the other way toward and ancient castle. It notice that the pub and the castle where closer together than the width of a normal roadway but the road we rode up on went between them just the same. They just paved right up the walls of both buildings carried on. We explored the castle a little bit but did not go in, it was something like 6 or 7 pounds and we had many other roads to ride. Shaun went back to the camp and Jonesy and I went on. I was keen to find Tynwald Hill and to ride some of the "b" roads on the Isle. I had an Ordnance Survey map and we just decided to pick a road and ride. The roads where very narrow sometimes one lane with high hedgerows on either side. They could be rough, challenging, and scary sometimes. Suffice it to say we had a blast. We eventually made it to the town of St. Johns and almost rode right past Tynwald Hill but at the last minute I recognized it. It seemed smaller than the pictures I had seen. 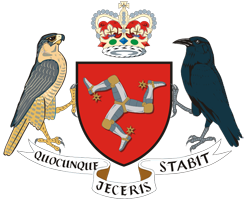 It's claimed that the Tynwald is the oldest still operating Parliament in the world. And the hill is the ancient meeting place of this very old form of representative government. 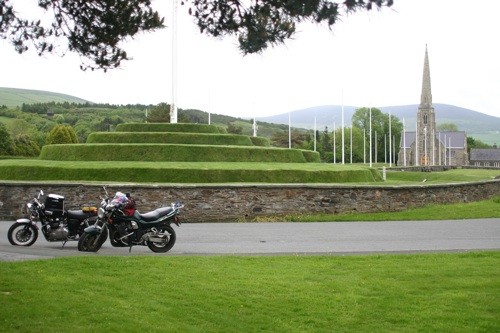 Tynwald Hill, I think most TT attendees blow right past it. The next day was practice day and we headed out to Crag-na-baa to watch. To say you can get close to the racing action is and under statement. There were places at that corner that I could have reached out and touched a race bike as it sped past at close to the ton. I am in awe of this event and especially of the racers. This is real world, no barriers between people. It's dangerous and there are real consequences to your actions, to yourself and to others, but that just makes it sweeter. This has not been engineered for your safety you are responsible for that. It kinda makes you pay attention and you end up caring about everything a whole lot more. Then again that sounds a lot like motorcycling in general. We stayed at the Craig most of the day and then went home to pub grub, beer, and mates around the campfire. Days like that are what life is for. I woke up slowly this morning because we where up rather late last night and because there is no racing today so there is no need to rush out of the campground before the road is closed to the public. Most of the camp was already gone so I went searching for breky. The cafe in Glenlough campground dose a brisk business and is a lifesaver. It's operated by the by the ladies from the farm and the food taste homemade and is delicious. Suitably nourished I decided to head out on my own in search of king Orie's grave. Bill told me about this ancient site. It's located in the town of Laxy, which is about 10 miles north along the coast from Douglas after a bit of searching I found the site literately in someone's backyard. It seems odd to me that here is a modern home so close to a prehistoric site and I don't know weather to be irritated at the occupants for breaching the respect of such a treasure or feel sorry for them and the public intrusion they must endure. There is also the lady Isabella in laxy which is the worlds largest water wheel. It was once a working tin? mine and the wheel powered the pumps that kept the mine dry. It was a marvel in its time and is still impressive. I paid my 3 quid and climbed to the top of Isabella for a fantastic view. There was quite a bit more to see but I had missed the tour of the mines and I was ready to move on. I spent the rest of the day riding down narrow lanes and taking photos. I took one ride over the mountain course and its not the twisty road I was expecting it is in fact a very fast road with some corners hear and there that need to taken with care. Of course at race speeds it all needs to be taken with care. That night we all climbed into the van and rode into Douglas for a pint and to check out the festivities on the promenade. 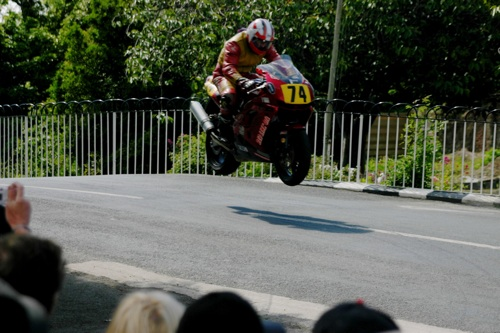 It was an above average pub crawl with pints on the queside, bands, carnival rides on the prom and a motorcycle stunt show thrown in for good measure. Next day you guessed it racing! This time we headed out with some new friends from camp to a place on the west side of the island. We got on the inside of the course in the village of Kirk Michel and watched the race bikes go by for a whole and I confess had a bit of a nap waiting in the warm sun for the racing to start. The real highlight of that day was getting to know George and Elaine as we sat in the sunny grass in between races. There is a lot of time between individual events during the day as there is almost 40 miles of racetrack to secure before the bikes can head out At some point in camp I mentioned that my great grandfather was born in a small town in Yorkshire and I would like to pass through there on my way back to Nottingham. To my surprise George said he knew just where the place was because he was born there. And was planing to stop there to visit his sister on the way home. He called his sister and we where invited to spend the night after we landed in Hayshem at her house. This was a happy turn as we had no place to stay that night after I had failed to find something on the day of our departure. I may have said this before having everything planed to T can really get in the way of a good trip. during the lunch break I got out the map and we headed to the top of the course to watch at the bungalow. We couldn't go straight there from Kirk Michel but we got close and hiked the rest of the way there. The highlight of that excursion was the friendly local I met standing along the fence watching the race. She was friendly, pretty, and we had a nice chat. She told me about her "local" called the Mines in Laxey and I made a mental note to return to Laxey for a pint. Anyway Jonesy and Shaun where impressed as was I really but as it turn out that was the last time I saw her. Oh well. When I did get to the Mines for a pint I made fast friends with several of the regulars and had a fascinating conversation with a long time marshal who looked to be in his 70's. Among the things he told me was that every one of the riders was a hero. And that the people of the island cherished the TT. I know for a fact that some of them don't and they can be vocal about it as well but there do seem to be a lot of local supporters. I got invited by my new friends to black hut (a viewing area on Snaefell) to watch the senior which I took them up on. I woke up the next day to find a new neighbor in camp. A beautiful AJS road racer from the early 60's and the man who raced it back then. He was there with his mate (his crew) and bike, all of the same vintage to take part in the historic parade lap before the senior on Friday. I was getting a rich history lesson about the TT not from books but from folks who where not necessarily celebrities but had come back to the TT again and again over the course of their lives. Both the marshal and the old racer told me that the track was well taken care of by the road works department and when I took a ride later that day I paid special attention to the surface of the track and saw that they where right the road was in a lot better shape all along the TT course then elsewhere. The rest of that day was spent riding the lanes and finding little nooks and carneys around Man. I did this mostly by myself because everyone else I was with wanted to ride the course. I very much enjoyed riding the same road the races where run on and I liked doing it quickly but going over and over it again and again seemed like a wast of time when there was so much else to see and do. I found old stone circles, little villages, beaches, palm trees, great little one lane roads, and farmers wives selling fresh eggs and baked goods from their kitchen windows. One of the things I did not find was Glen Maye. I looked all over for it, parked the bike in several places and walked to where I thought it would be but some how I missed it. I'm sure it was a "carbon based problem" as a computer nurd friend of mine says. The Isle of Man seems to me to be a micro Britten. It's much smaller of course but still has a diversity of landscape and scenery that makes you think of the larger island to the East albeit 50 years ago. 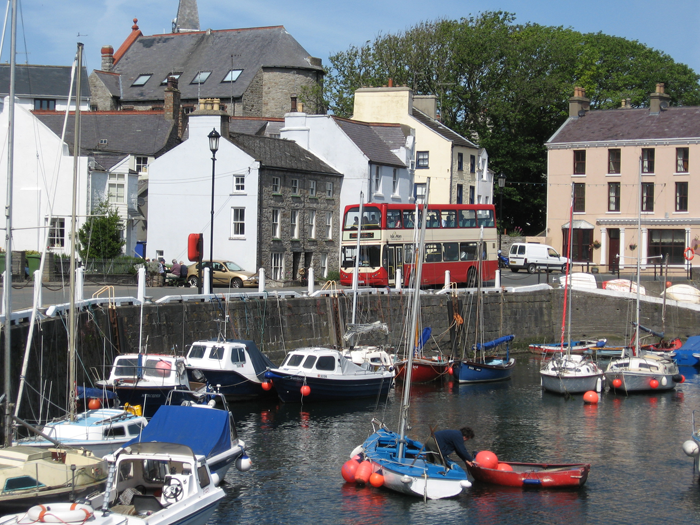 You can find city streets in Douglas and uninhabited rocky shores here and there around the coast and small villages and homesteads in between. I found great joy in coming around a bend and unexpectedly finding an expanding view of the sea off in the distance with a patchwork of low stone walls and little white cottages between here and there. But of course the people are the life of the Island and all of my exchanges with them where good ones even when getting told off about my riding. That night we had a BBQ in camp and I contributed Hamburgers, which did not come out as good as I had hoped but every one who had one told me the liked them. I think the problem with British hamburgers is the "Minced Meat." You can't find Ground beef in the store, what they have is called Minced and the grind is too fine for good hamburgers. Still this is whats so enjoyable about camping some people look at it as work to cook and clean and do all the other chores that need to be done to take care of a campsite. But there is great joy in all that accomplishment especially when it's shared with friends, new and old alike. The next morning Shaun and I piled into a van with an old AJS roadrace bike and the crew to be smuggled into the pits for Senior race day. If that sounds like a stroke of luck it was we had no passes to get in but we did have new friends who hid us in the back of their van. Being in the pits during a race is an action packed adventure. lots of people and all of them on a mission. I helped where I could and then had a look around. One of the most vivid memories I have from that morning is the "Italians." Communication was impossible so I just watched as this group spent a long time arraigning a line of vintage Italian race bikes in perfect position. All the wheels had to line up just so and the handlebars had to be turned to just the right angle and the order was important too. The Bikes where beautifully restored but the show was even better. But then in one corner of their pavilion I spied the pinnacle of internal combustion ingenuity. Not a motorcycle, not a generator, certainly not a car. what I saw was a hand made, obviously machined out of solid billet, over head valve with exposed pushrods and rocker arms salami slicer. That's right add a little petrol, turn on the ignition pull the starter and slice salami for sandwiches. I think that's the moment I decided to buy another Ducati. Once again I was invited into someones home who I had just met to spend the night. I must say that I have found the British to be a very friendly people. No where have I not felt right at home and I or we have had countless offers of rides or places to stay or help in some fashion or another. Besides the hospitality the other thing I remember was the open coal fire in the living room. I feel foolish but I now know why so many homes in Britten have tiny fireplaces. They are designed to burn coal not wood. The thought never crossed my mind. some times the simplest things evade me. But a sleeping bag on the floor next to a coal fire is still warm. And I was very thankful for that warmth because now that we are off the Island and on a larger land mass the mediation effect of the ocean is not so apparent and it's cold. In the morning we stopped by the row house that my great grandfather was born in and while I was taking a picture the folks who lived there came out and chatted with me. There was no family relationship between us but the friendliness of the British continues. After that George and Elaine headed for Wales and Shaun and I headed for Nottingham. We got to Bill's a little late but in time to watch Moto GP on the Telly before Bill took us to pick up our rental car for the drive back to Gatwick. On our way through London we again Looked for the Ace Cafe and this time we found it. After a good lunch and a few souvenirs bought, we headed south again. Our last night in England was spent in a pub in Surrey that I had frequented on my first trip to these Islands 9 years ago. we ended up in a lock-in with the very junior bartender that was left in-charge. There where rooms upstairs at the inn but they where not made up for guests. We where however welcomed to stay anyway and ended the night sleeping on whatever soft place was available for a very small donation to our host. The proprietor I had know years ago was no longer there but he was remembered by the staff who fed us as well as quenched our thrust. In the morning the current publican came home and it was apparent that it was his son who had been left to run the place. He didn't look to happy about Shaun and I being there so we left quickly, had a plane to catch anyway. To say I don't want to leave is an under statement. I want to know what it's like to live in Britten. I've experienced this country as a traveler and that is a world away from the slog of day in and day out existence. But I have a hunger for a different view of the world. Call it a broader perspective or just the grass is always greener syndrome. It doesn't matter I feel it tugging at me.